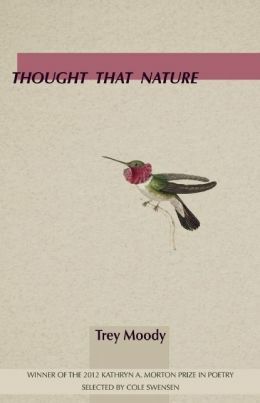 Recently, Sarabande Books released Trey Moody’s debut, full-length collection of poems, Thought That Nature; the book explores our relationship with nature through a deeply meditative and musically-charged poetics. In her forward to Thought That Nature, Cole Swenson, who selected his manuscript as the winner of the 2012 Kathryn A. Morton Prize in Poetry, argues that Moody’s poems imbue the concept of nature with a “tension” replete with a “historical dimension” (vii) that challenges us to more thoroughly consider what nature actually is and how we respond to it. To this end, she claims that the poems in Moody’s book exhume the “subtleties” of nature that, ultimately, “shape our lives” (ix). Trey Moody lives in San Marcos, TX where he is remotely completing his Ph.D. in English Literature and Creative Writing from University of Nebraska.In addition to Thought That Nature, he is author of the chapbooks Climate Reply (New Michigan Press, 2010), Once A Weather (Greying Ghost Press, 2011) and the collaborative collection How We Remake the World: A Concise History of Everything (Slope Editions, 2012), which he wrote with some other knuckle-head. Last week, Moody was kind enough to answer some questions for me–via email–about his new book. Well, the way I read Dickinson’s poem, she’s poking fun at how problematic the word “nature” is, a notion that speaks to all the poems in my book. I’ve always thought it funny when someone (me included, at various times of my life) says something like, “I love going out into nature”; it’s not that our word choice is incorrect, necessarily, but this stance assumes that nature is something over there, not here, into which we, separate from it, must enter. I think Dickinson was having fun with people’s conceptions of these types of artificial dichotomies, preferring instead to maintain that humans—even the things they make and their spiritual inventions—were merely small parts embedded into the grand entity of nature. Of course this concept isn’t anything new—I’m thinking of some canonical haiku, Virgil, etc.—but what is interesting is how still (in 2014!) some folks resist this stance, even considering it threatening. I like how your reading of the Dickinson poem undermines the notion that “nature is something over there, not here, into which we, separate from it, must enter”; to this extent, it imbues your use of Lewis and Clark quotes in “Lancaster Country Notebook”—which is Thought that Nature’s second section—with a certain amount of irony, at least to the extent that these were adventurers heading West to explore the wilderness. Could you describe how you stumbled upon their journals? Why did you decide to work with them? What was your process of reading and writing through their work? How do you see their journals engaging the poems in your collection? That’s true, I think there is a certain amount of irony that goes along with including them in the context of Dickinson’s poem. Those journals are amazing, but as you read them you see how their writers’ lack of understanding their unexplored environs leads them to projecting themselves more and more upon the land and its organisms. But I love the raw earnestness in their language, steeped in (I think) a fear of the unknown, isolation, etc. There’s something energetic in imagining each explorer scribbling down his notes after an arduous day, not knowing what the next will bring, seeing where his mind drifts. And I enjoy the authenticity of their journals, especially with their preserved misspellings (you quickly learn that Lewis was a much better speller than Clark). I first started reading them in a Great Plains Lit course at the University of Nebraska, after I had been living there for about a year and a half, still learning my way around, so I think I was comforted by the writings of others as they were exploring the uncharted version of the region I was living in and trying to understand. I wanted to get even closer to their language, so during that spring, whenever I wrote a poem I grafted language from the corresponding date’s entry in 1805 into my writing. I had never really borrowed language before, perhaps for fear of some kind of exploitation, but in this case I felt like I was exploiting fellow exploiters, which seemed permissible, though maybe it’s not. You’ve interspersed a suite of prose poems, each titled “A Weather,” throughout the collection. The first sentence of the first permutation straightforwardly inquires: “Why a” (6). This interrogation of the indefinite article reminds me a bit of Zukofsky’s claim that a poet should give “some of his life to the use of the words the and a: both of which are weighted with as much epos and historical destiny as one man can perhaps resolve.” So, my question to you, then, is why “a”? Additionally, I’m curious about how you understand the relationship between organized sound patterns and weather. I mean, the “A Weather” pieces are so intensely musical that the form of expression seems to tacitly suggest a deep or meaningful relationship between them. Why a? I’ll tell you why a. If not for a, it’d be the weather, and we all know how unspecific and unrelenting that can be. But in all seriousness, I do find it interesting that we say “the weather,” as if it’s experienced exactly the same way by each individual. To my mind, “a weather” feels more intimate to how a specific individual experiences climate conditions. I like that Zukofsky essay a lot, and in a different essay he speaks to how the sounds of words themselves can’t not carry a kind of meaning: “It is this musical horizon of poetry […] that permits anybody who does not know Greek to listen and get something out of the poetry of Homer: to ‘tune in’ to the human tradition, to its voice which has developed among the sounds of natural things, and thus escape the confines of a time and place.” This sort of meaning is certainly less semantic, though as the poet Ralph Angel said in an interview, “there are different kinds and levels of understanding.” So in the “A Weather” sequence, I wanted to largely abandon semantics to (hopefully) produce swells of other kinds of meaning, sometime random and associative and sometimes repetitive, just as one might experience weather. OK, then, what does one achieve (as a writer and/or a reader) from accessing meaning that avoids semantics in favor of randomness or associative patterns, particularly within a poetic context? Moreover, I’m curious as to how you understand the poem (or your poems) as an engagement with a broader, public context. In Thought That Nature’s introduction, Cole Swensen suggests that your book implicitly addresses issues of environmentalism and global community-formation. Do you agree with her assessments? Do you believe in pragmatic, political, or efficacious poetry? Why or why not? Do your thoughts on poetry in the public sphere agree with or contradict your thoughts on the non-semantic value of poetry? I think what one can achieve (as writer or reader) is the opportunity to receive language differently than the ways we have been trained to consume it in school, advertising, and politics. Of course, stripping the kind of meaning to which we are accustomed from words makes for an uncomfortable reading (and writing) experience, but such discomfort seems necessary in being able to earnestly revise our language—how we use it and how we are used by it. But poetry mustn’t always be so extreme in its stripping of semantics to accomplish this goal. To this extent, I think all poetry is, as you say, “pragmatic, political, efficacious,” though in differing ways and to different levels of effectiveness. In 2014 America, just the decision to write a poem—as opposed to an essay or Facebook post—is political. And regarding the poems in Thought That Nature, I do agree with Swensen’s assessment because things like the environment and global consciousness are important to me, so I would expect them to come up in my writing; however, I didn’t necessarily intend those things to be at the forefront of these poems at the time I was writing them. Basically, I see the poems as attempts of trying to understand the world, which is impossible and thus must include many failures along the way. I like the notion that poems are sites of failure that act as catalysts for an impossible understanding of the world around us. Could you elaborate a bit more on this idea and, perhaps, provide some specific examples from Thought That Nature? Also, on a somewhat similar note, it seems as though the poems in your book reach for that same understanding through negation; I’m thinking specifically of lines such as “You cannot remember what your body does // but you believe your body’s not a tree, a tree not a body” (13) and “I am not the moon, nor am I the tree” (68). Could you address how, to your mind, negation functions within your poems? I guess what I’m thinking is that poems—the ones I write and the ones I like to read—embrace the world as this giant thing filled with many smaller things, yet they also embrace how terrifying and mysterious the connections between, the sources of, and the fates for these things are. Like, as humans we experience the world by way of our senses, which may seem accurate to us, but these same senses are just such giant failures. In a section of “Backyard,” I write, “Wind blows— // I can’t make sense / of it, even” (64). Of course language itself is similar to sensorial experience, in that it feels like some kind of truth but is only another series of failures. For example, in the book’s opening poem, “We Use Spoons Mostly,” I call myself out for relying on a somewhat cliché simile. One way to think about negation in my poems, perhaps, is as a kind of avoidance, as a kind of laziness in confronting the poems’ subject(s). Recently I’ve grown more wary of negation for this reason. But I hope that such avoidance isn’t the case in these poems, especially the ones you’ve quoted from here, whose negation of things actually implies a desire to be those things by the act of simply naming them. When I write, “I am not the moon, nor am I the tree,” I may not be saying what I am, but what I wanted and tried to say was, “I am the moon, and I am the tree,” but just wasn’t able to. The very last poem in the book, “Dear—,” addresses this as well in its opening sentence: “I said Ghost because I couldn’t / say anything better” (73). Several poems throughout Thought That Nature reference specific locations, such as the poems “Salina, Kansas” and “Chatter,” the latter of which states: “There was once a glacier / here. How it has become / Nebraska” (11). Could you discuss how place affects your writing and/or your writing-process? How attentive are you to your geographic surroundings when you compose a poem? Generally speaking, what is your relationship to place? Place is very important to me. When I was younger, thinking about places—their geographies, histories, weather patterns—helped satisfy some kind of anxiety I had about wanting to grasp or understand places, which to me were frightening because they seemed so enigmatic. Well, older now, I’m not any wiser (probably less so, even) but I’ve at least admitted a sort of defeat. I’ve realized that it’s pretty much impossible to figure out places, even small towns or neighborhood parks. About the park, for example, if you stop to think about it—where all the gravel was harvested from, who all was involved with the harvesting and then distributing, who drove the trucks, where each tiny part of the swings came from, how each part was made, what kind of flora and fauna frequent the park and how the seasons or even occasionally high air pollution levels affect these nonhuman visitors’ presence, the zoning and bureaucratic histories of establishing and maintaining this park, the vast history of what preceded the park at its specific geographic location, etc.—you see how no one can possibly know all of this. Yet for me (and many others, thankfully) it’s important and rewarding to think about these things. As I compose poems, I do think about these things as well, but less steadfastly. I tend to focus on language when I begin writing, but when my attention wavers in the act of composition, I try to rely on my senses—however faulty they are—for any kind of data that might serve as a trigger, like the wind blowing tree limbs into the window or the smell the heater makes the first time it’s turned on for winter. And the heater example might make my mind wander into thinking about industry, energy policy, isolation. I imagine most poets and writers do this, too, because it’s really the most convenient way to gather material. Plus, it helps me feel more present, which doesn’t happen often enough during days filled with responsibilities. Finally, tell me a bit about the writing you’ve been doing recently. How does it relate to the poems in Thought That Nature? Are they in a similar aesthetic mold, or have you altered your writing style or interests in any manner? The newer poems I’ve been working on feel quite different from those in Thought That Nature. For one, there’s often much less white space in my newer poems, many of which are single stanzas or strophes with longer lines. Also, they feel quite a bit more personal—not in a Confessional sense or anything—but so far these newer poems seem to have a closer relationship to the body than those found in Thought That Nature. They’re definitely still concerned with place, but probably in much less obvious ways. But these are still so new, which makes me a little nervous to talk any more about them! Last week, I visited Lincoln, NE for a few days. During my stay, I spent some time with the poet Trey Moody. Trey’s first book, Thought That Nature, was selected by Cole Swenson as the winner of the 2011 Kathryn A. Morton Prize in Poetry. Sarabande Books will release the collection in January of next year; below are a couple video clips of Trey reading poems that will appear in it.